A.M.P. 189. (printed as AP2580A but this is crosssed out). 'Bag The Hun! - Estimation of Range & Angle Off - 'Try This Series Of Exercises & Improve Your Shooting'. (For Official Use Only). P/b, 18 x 15cm. 48p, Air Ministry, April 1943 - reprinted incorporating minor corrections November 1943. 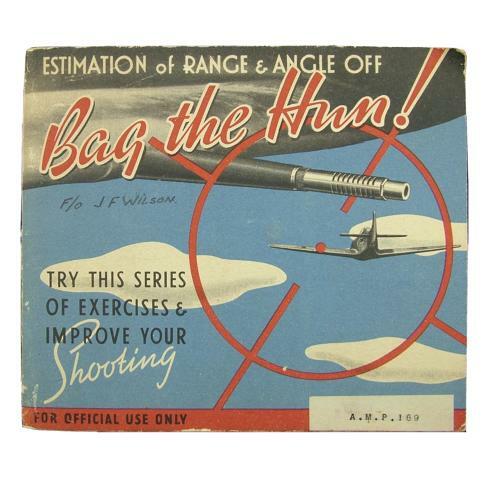 A booklet explaining the various factors to be taken into account when firing at enemy aircraft. Written in easily understandable language with cartoon drawings etc. A little grubby with dog-eared corners/pages. Named to a F/O J F Wilson on the cover. An excellent little booklet. Stock code P22766.